U.S. Secretary of State John Kerry, left, is greeted by France's Foreign Minister, Laurent Fabius, in Paris, July 26, 2014. Foreign ministers from seven nations are calling on the Israeli military and Hamas militants to extend the 12-hour humanitarian cease-fire in the Gaza Strip. U.S. Secretary of State John Kerry and diplomats from France, Britain, Germany, Italy, Turkey and Qatar gathered in Paris Saturday to discuss the Middle East peace crisis. ​French Foreign Minister Laurent Fabius told reporters after the meeting the seven diplomats are urging a lasting cease-fire that addresses Israel's concerns about security while also trying to accommodate Palestinian demands in terms of spurring economic development in Gaza. Israel's offensive in response to Hamas rocket attacks from Gaza is now in its third week. Medical personnel in Gaza say more than 100 bodies were pulled from homes during the truce Saturday, raising the Palestinian death toll above 1,000, including many civilians. Thirty-seven Israeli soldiers and two Israeli civilians have died. The 12-hour cease-fire went into effect in Gaza Saturday morning (05:00 UTC). Kerry has said the cease-fire is in honor of Eid - the Muslim holiday marking the end of Ramadan. Israel said its security forces would continue searching for tunnels used by Palestinian militants during the lull. Palestinian officials say more than 70 bodies have been pulled from the rubble of destroyed buildings as a 12-hour temporary cease-fire Saturday between Israeli and Palestinian fighters brought an uneasy calm to the Gaza Strip. 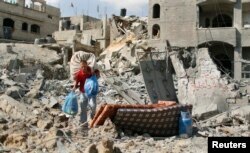 A Palestinian man carries his belongings from his destroyed house in Beit Hanoun town, which witnesses said was heavily hit by Israeli shelling and air strikes during Israeli offensive, in the northern Gaza Strip, July 26, 2014. Rescue workers in Gaza searched for bodies in the rubble of buildings hit by Israeli fire. Residents buried their dead and stocked up on supplies. People displaced by the fighting visited their homes during the cease-fire to inspect damage. A spokesman for the Hamas group that controls Gaza said Friday it would observe the temporary truce. Israel said its forces would hold their fire during what it called a humanitarian window but government spokesman Mark Regev warned of retaliation if this was violated. "We will honor this humanitarian cease-fire but if Hamas attacks us, shoots rockets into Israel or attacks our troops we will of course reserve the right to defend ourselves," he said. Just before the cease-fire took effect Saturday morning Palestinian militants clashed with Israeli military forces. Palestinian officials said more than 900 Palestinians had been killed during the nearly three weeks of fighting and some 5,000 had been wounded. Relief groups said three-quarters of these were civilians, one-fourth of whom were children. Thirty-seven Israeli soldiers were killed in the operation aimed at destroying Hamas rockets and tunnels into Israel. Two Israeli civilians and one foreign worker in Israel were also among the dead. He says we are looking for a long-term truce. We do not want to keep waiting for a truce day after day. We are homeless, he says. We are living here in the schools and our children are very tired. A resident of Tel Aviv, Shahar Binon, indicated many Israelis were also tired of the violence. "Personally I think everybody is fed up with this situation. I think we have done whatever we need to do, both parties by the way, not only the Israeli party. And I think we have to understand that we have finished our business there," said Binon. But Israel and Hamas appeared to be far apart on a cease-fire proposal put forth during the week by Egypt, the United Nations and the United States. Israel wants to de-militarize the Gaza Strip, while Hamas says Israel must lift its blockade and cease all aggression.